How did last week get away from me? Well, however that happened, I certainly don’t want to miss out on sharing my thoughts on this week’s blog topic – Leadership. As of this year, my 14th year in education, I have worked in three different districts, on four different campuses, in three different levels, and for six different principals. I have had a wide variety of experiences during those years that I treasure and hold close to my heart, as well as some experiences I choose not to dwell on. I have worked for amazing leaders and those I would not choose to work with in the future if I had the choice. What I have learned during that time is that as a classroom teacher, I can make the classroom, and a strong principal, a leader, can make the building. I first saw the above image when I had the pleasure of attending the Plano ISD Library Expo in October 2016. The keynote speaker that day was Heather Lister (@LibrarianLister). She used this image in her presentation and it resonated with me thinking about the bosses and leaders I have worked with in the past. One person stands out to me the most: Laura Springer. Springer (we all call her Springer) is the principal of Coppell Middle School East in Coppell ISD where I was a 6th grade classroom teacher for six years. The five years I worked with her building were absolutely amazing. She was the epitome of a leader. She arrived on our campus following a principal who had been ill and wasn’t able to fulfill her duties for health reasons. Springer brought a wave of new energy, positivity, and love (yes, love), into the building. The staff soon became a close knit family and when I left there and moved into my first librarian position on another campus, I balled like a baby in front of them all. True story. 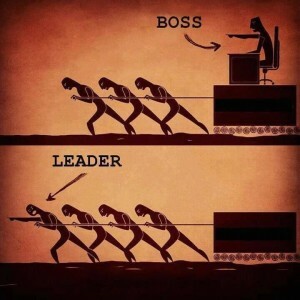 This picture I saw in Heather’s presentation hit me hard because I have worked with bosses who take on the qualities of the figure in the top half of the image; those who stand away from us and hand out directives. They were disconnected and far from us in “the trenches” and I didn’t feel inspired and invigorated to do more than I was doing. Springer was the leader in the front in the bottom half of the picture. She was right there with us, in the halls with students, taking up for us in meetings (even when she received the backlash), putting herself out front to go alongside us, not above or behind us, caring about us and our families on a personal level. I found myself working harder than I had ever worked, but being happier than I ever had been in my professional life before. I looked forward to going to work, and not only because of my students (although they were always a huge part of that), but because I felt like I was going to work to see my other family and who doesn’t want that feeling?! Working for a principal like Laura Springer has jaded me a bit! I do expect my leaders to have those qualities now that I have seen what a true leader can do for a building. And I also can expect that same standard for myself too. When I have leadership roles on my campus, I want to display that same leadership quality – someone who is willing to get out in front and emulate what I would want from my teammates. We are all better together!